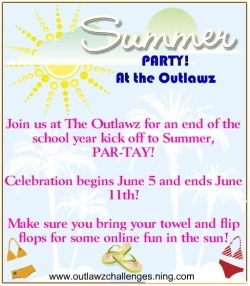 It's a PAR-TAY - over at the Outlawz - no sunscreen required. No cards to post this week - my DD and I have been playing cowgirls all week at the ranch - Yee Haw!! Met up with some friends from Germany and had a great time. One more fast ride today and then a guest rodeo tonight and we'll be done. It will take a while for us to quit smiling. My gift to several of those I know here was to make sets of cards for them (what a surprise they all had a western motif). Looking forward to getting some things done in my stamp room this week. Working ahead on some birthday cards.....which rarely happens but I decided to break down and buy myself the new Grand Caliber and a die so its been killing me to not play with them! This was a fun stamp I purchased from Verses Rubber Stamps - when I saw it I immediately thought of my 'book club' buddies...we have been know to have a glass of wine during our dinner conversations at book club - most of us are older and we have one young un we tease regularly about all the things she needs to know to age gracefully :) - I have also been in the mood to make an easel card so when the time was available I had a little fun in my stamp room. While I wanted to layer - I didn't want the layers to look like they were all stacked neatly, so I made them skew some to the right and some to the left, it reminds me of an optical illusion. The yellow pearls were added because I think sometimes you need a little surprise color in a card and this was mine. Supplies: Grand Caliber, Grand Big Scalloped Circle Die, Tag die, ribbon, metal stickers, CS, Verses Rubber Stamp, Memento Ink, Brilliance CS, Copics, Embossing folder. 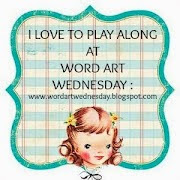 Since blogger was down for a day it looks like my Thank You to Angella Crockett at our Daily Bread Designs Blog didn't get posted. What a surprise when I found out she had chose my 'Count Your Blessings' with a flower as the 'Customer Card of the Day' this week! If that wasn't enough the lovely things she said about both me and my work was very uplifting. The Our Daily Bread Blog and Angela's blog are one of my favorite to visit for ideas and inspiration, their design team members are really gifted. Thank you for the honor - it just made my day!! Another wild and crazy week in my house.....I did however, get to spend most of Mother's Day playing in my stamp room and this is one of several creations. The challenge required embedded embossing and this is something I have been wanting to play with. I had fun doing this and I actually made three cards, very similar with this technique. Pink is one of my fav colors so that made it even more fun. Entering this in the challenges over at Our Daily Bread Designs Challenge SLC 59 (embedded embossing) and, Stampin Sisters in Christ for their challenge to make a card with 'all things beautiful'. I'm not one to use lots of bling (not because I don't want to I just never seem to leave enough room) - this week I found some space to put some pearls on. Supplies: DP, MS punch, EF and Cuttlebug, Grand Calibur and Fleur De Lis die, pearls, ODBD Sentiment, Memento black and angel pink ink. Not a fancy card, by any means today, but at least I feel like I was able to play. There is soooo much going on around here getting the house ready to put on the market that I feel like I have little to no time to stamp. When I'm not cleaning closets and talking to workmen I am on the internet looking at homes in the Atlanta area.....sometimes I feel like my head is going to explode, they ALL begin to look alike. My Mothers Day gift to myself is to spend the day stamping and playing. I have a long list of cards to work on and I am looking forward to it. Today's card is one of many I want to get ready for our church bookstore, who has graciously bought my cards to sell.....they are in need of a few more. I used my new Our Daily Bread Designs frames and matching Nestabilities.....thought I should add a little something so played around making a crinolin flower with some netting, this makes a nice soft flower and one that should mail easily. Wishing all you Mom's an early Happy Mother's Day.....sadly my mother and my DH mother have been gone for many years, but we will be thinking of them Sunday.